The Board of Selectmen on Tuesday voted unanimously to enter into an $8,000 contract with a New York City-based engineering firm that specializes in parking facilities, the first formal step toward adding spaces at New Canaan’s most coveted commuter lot. DESMAN in three to four weeks will provide New Canaan with “several different concept designs” for a parking structure at the Lumberyard Lot, Public Works Director Tiger Mann told the selectmen at their regular meeting, held in Town Hall. Officials from DESMAN already have walked the property and will come back for another review prior to putting together three functional designs, Mann said, that New Canaan could choose from. First Selectman Kevin Moynihan and Selectmen Kit Devereaux and Nick Williams voted in favor of the contract. The funds will be paid out of the DPW’s current engineering and administrative budget. Officials have estimated that some 250 spaces could be added to the Lumberyard Lot, which currently has 351 spots. Of those new spaces, about 75 would serve businesses, Moynihan has said. About 600 people were on a waitlist for Lumberyard Lot permits as of November, according to the Parking Bureau. Devereaux asked whether DESMAN is expected to consider the topography at Lumberyard, which slopes down from Elm Street, opposite Karl Chevrolet, toward the train tracks and station. Williams asked whether site planning done about 15 years ago for Lumberyard will be used by DESMAN. Mann said it would be. Those designs, coming it around $12 million, were found to be prohibitively expensive, Mann said. The $100,000 that town funding bodies had dedicated toward a plan, now scuttled, to create a parking deck at Locust Avenue, could be transferred to the Lumberyard project with authorization from the Board of Finance and Town Council, officials said. Moynihan said, “We are looking at alternative proposals for the east side of town,” though it wasn’t immediately clear just where or what those alternatives are. 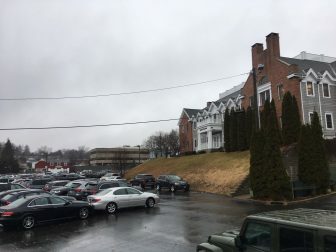 He noted that due to a recent property transfer, New Canaan could lose its access to the “Telephone Lot,” which provides 18 permitted spaces at Cherry and Main Streets. “We really just have to look at the whole range of possibilities for the Lumberyard,” he said.